This Monday, I'm sharing with you all my current financial obsession, Wealthfront, an online service designed to make investing easy and affordable. Three years out of college, while I may not have figured out the "real" world quite yet, I feel like I'm starting to "get it" when it comes to my financial life. I've been able to check off many of my financial goals, such as building an emergency fund, establishing a strong credit score and finding a budget I can stick to. A few months ago, I felt ready to take the next steps in my financial life and find a way to make my money work for me. I found myself thinking "What's next?" My answer? Investing. If you're anything like me, the thought of investing sounds a little intimidating. Sure, the idea of watching your money grow is exciting and appealing. But, as soon as you begin researching stocks and bonds or the differences between mutual funds and index funds, it all seems a little overwhelming. I often thought it was better to keep my money safe in a savings account than to risk losing it trying to make investment decisions on my own. Many people get to this point and either give up or turn to a full-service broker. Investing your money with a broker can, often, be a much better decision than doing nothing. At least your money is growing. However, investing with a broker, especially as a young person, can bring challenges of its own. First, many brokerages require a minimum balance to open an account, often times well over $5000, which can prevent many young people from even getting their feet wet investing. Second, even if you do meet the minimum balances required, the trading fees can be costly. Even well-respected "discount" brokers, such as Fidelity, charge upwards of $5 a trade. $5 may not seem like much, but depending on the funds you are working with, it can add up quickly and eat into your profits. Last, it is widely known that brokers make a majority of their earnings, often well above 90%, from the top 10-20% of their clients. If you don't fall into this bracket, your accounts will receive limited attention. Even if it may not seem like much to someone else, the amount I wanted to invest felt like a lot to me. I wanted to invest with someone who would prioritize my account accordingly. Enter Wealthfront. Wealthfront is an online brokerage with a convenient and user-friendly app that makes investing affordable, accessible and easy to understand. We all have different financial goals and Wealthfront creates a plan personalized to your needs. Whether it be saving for retirement, selling company stock or simply growing your savings faster than a general savings account, there is a unique plan for you. When most of us think of investing, we think of active investing, ie Jordan Belfort and Wolf of Wall Street. 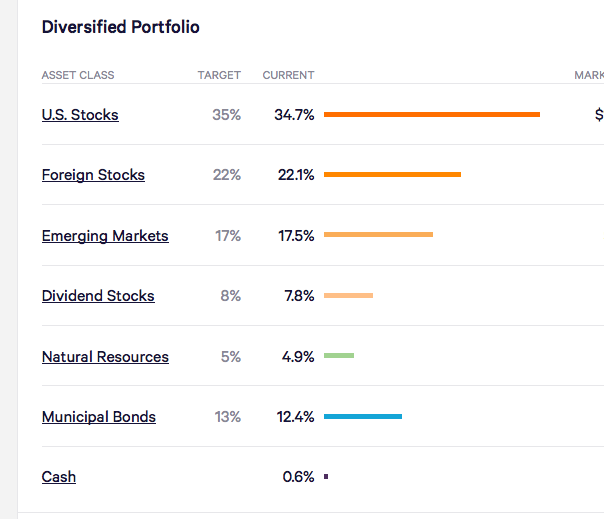 While active investing sounds exciting, 93% of actively managed portfolios in the US under performed in 2016. Wealthfront is built on the idea of passive investing, meaning: choose low-cost investments, diversify and have the patience to stay the course, even as the market fluctuates. The exact opposite of active investing. While it may seem boring, when it comes to long-term investing, you can't expect to consistently outperform the market. If you need a little more convincing, Warren Buffett is quite possibly the loudest advocate for passive investing out there. Overall, in the five months since opening my Wealthfront account, my initial deposit has grown by 6%, nothing astronomical, but certainly more than it would have grown sitting in a savings account. Thanks to an amazing concept known as compounding interest, your earnings will keep investing themselves, earning you exponentially more money. For example, let's say you started with a $10,000 investment. If, at the end of your first few months, you had earned 6% like me, you would now have $10,600. At the end of the next few months, assuming the same rate of growth, you would now have $11,236. You would have made $1236! Doing absolutely nothing. I can now go to Happy Hour and sit back, drinking a glass of rose, knowing that I am earning money while doing it. Which is a pretty cool feeling. The best part about Wealthfront? No minimum balance. If you're ready to take the leap into investing, use my exclusive link and have your first $15,000 managed free of charge. Happy investing!